While reading a post on Flowerdust by Anne Jackson about not feeling good enough and insecurities, I was reminded of a day when I took a risk to overcome a major insecurity. 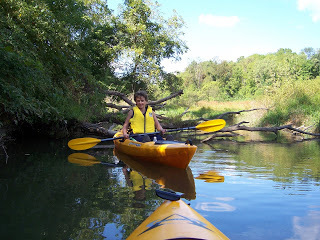 A year or two ago, my husband Jerry and I, along with our friends, Ty and Loretta, took a chance on a late summer day to kayak the Brandywine Creek. As the name would suggest, it’s not a big river – but we had rain earlier that week and checking the water levels online assured us that we wouldn’t be hitting bottom all day. The day was perfect – nice warm temps, sunny and better than expected water levels. The scenery was great, as the creek wound its way through pastures, farm land and small towns. We stopped at a small alcove to eat our packed lunch. A few times, we had to get out and drag our kayaks over low spots, but there were also some areas where the water flowed nicely over rocks and we had some rapids to conquer. After an hour or two of this perfect day, I was feeling like all was right with the world. I was outdoors doing something physical with great people and shooting rapids. (yes, they were small compared to what my teenage sons do, but they were perfect for me) I felt like I could conquer the world! The day really was perfect … did you get that? I was loving the day … except for the major disappointment in my life that I couldn’t do a darn thing about and the insecurities it caused me to live with. I didn’t think I could ever fully enjoy life again, because this hounded my every moment. I felt helpless to move beyond the insecurities it gave me. We all started the day wearing layers and as the temps rose in the afternoon, everyone began peeling long pants and a shirt or two. My layers of shirts went, but I couldn’t bring myself to peel off my long pants. I had pulled on shorts first that morning, but hadn’t really planned on taking my long pants off. I laughed … a little – still annoyed and wishing I could shed my fear and fully enjoy the day. I was frustrated at how restricting it was and how helpless it felt to live in the grip of what I thought others would think. Because of that blasted accident, if I took my long pants off, I’d be looking at this … and maybe others would see it too. 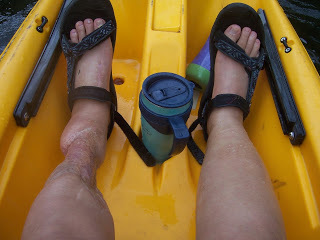 My long pants came off and I continued floating downstream – surprised that the world didn’t stop. The sun still shone, the water still flowed and the cows still ate grass along the banks of the creek! We passed a few kayakers taking a break and nothing happened. We exchanged greetings – just like normal. I chuckled to myself realizing how narcissistic I must be to think that the world would stop and/or be different because my deformed leg was now exposed to it. After getting over myself – I realized I felt freer than I had since 2004. I liked the feeling of being fully me – fully alive! Yes, the looks on their faces were priceless! I fairly sure they googled “Alligators in Brandywine Creek?” when they got home. I hope they’ve gotten over it by now – Loretta and I were laughing too hard to explain anything as our kayaks floated on downstream. I still struggle with it at times, but I realize that life is too short to have it and/or what others think rule my life. So thanks Loretta – for helping me take a major step in fully enjoying life again, even when living with disappointments and insecurities. cause you to be insecure and not fully live? looking for them now that's for sure!! @anonymous – so sorry for the pain/humiliation you've faced. Ugh, hate when that happens! Knowing the pain you've experienced gives me pain. Hoping the future is different from the past and you can begin to live life instead of watching it go by. @Becky – always good to be on the lookout. @S. Etole – very true. And that can be both good and bad. you and loretta are quite a pair. You're absolutely right about the narcissism thing. I'm much more the center of the universe in my own head than I am in reality. Fortunately, my Wife is very good at making sure that I am reminded of the fact. That took courage on your part. I'm not always successful in finding inner strength like that, but I try.